Left of the rock, right? It was one of my first rafting trips. I was with my brothers-in-law. We were rafting the Green river in Washington on a chilly day in April. Bob was calling the order. He was at the back of the raft steering and giving orders for who needed to paddle. The six of us trusted him. . . perhaps a little too much. 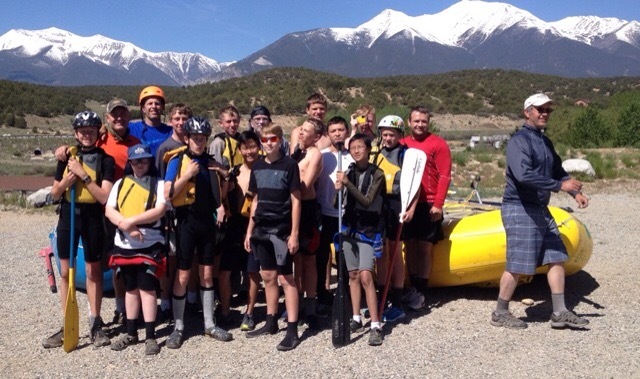 Yesterday was our first day on the Arkansas River in Colorado with our scout troop. I was in a boat with my son, some of the other scout leaders Jim and Jacob. Jacob manned the oars. When you go rafting, there are two types of boats you can take: oars or paddle. Oar boats have a set of oars and an oarsman. He sits on a metal frame and directs the paddlers. The metal frame sits right in the middle of the boat and is apparently designed to inflict the maximum pain on those people sitting around it when they encounter rapids. Paddle boats are the same size rubber rafts without the metal frame. The guide sits at the back of the boat and steers. As we pushed off into the Arkansas river we did a little practicing with our strokes. meant everyone on the right side of the boat paddle. Same thing for those on the left. There are a couple other commands like, Backpaddle and highside, but it’s really a pretty simple structure. The issue you run into is when you are announcing which side of a rock you are going around. so it will turn the boat to the right. It can get confusing if the caller isn’t very clear on whether he’s calling stroke commands or directions. The first few rapids were minor. Class II which meant they barely rippled. Before too long though we hit the first Class III rapid. Class III’s are bigger waves and it’s important to have everyone in the boat pulling the same direction. As you can imagine, both sides started paddling with all our might as the two leaders kept yelling conflicting commands. We bounced off the rock and spun around to the left as we came out of the rapids. Hey guys, I don’t care which one of you calls the commands, but we can only have one Master of the Boat. Jim realized that as the oarsman, it was Jacob’s role to call commands. We need to reduce the load on our support staff, so agents should be handling their own issues as much as possible before engaging support. We need to return to service as quickly as possible when there’s an issue. Agents should engage support at the first hint of an issue. It’s important to only have one Master of the Boat. The tendency is to defer to the director since she has the bigger office. If she has all the information needed to make a decision that makes sense. But, sometimes the team manager, because he is closer to the point the rubber raft meets the road, has a better plan. Regardless of which one ultimately is the final decision maker, your organization has to pick one. Once you’ve decided on a single Master of the Boat you can still run aground if he doesn’t lead. As my brothers-in-law and I made our way down the chilly Green River, Bob was our Master of the Boat. And he was doing a good job. We’d made it through some strong Class III rapids successfully. We approached a large house sized rock squarly in the middle of the river. The river split and dropped a couple of feet before rejoining on the other side of the rock. It wasn’t even difficult enough to be classified as a real rapid. The water was smooth but fast. We’re doing down the left side. RIGHT SIDE paddle. We got perfectly lined up on the left hand channel and then. . .For some unknown reason Bob decided at the last minute he wanted to take us down the right side of the rock. It was too late. He turned the boat and managed to get halfway back across the river. The face of the rock had a gentle slope to it. We hit that gentle slope broadside. It lifted up the left side of the raft and dumped all of us out the right side. The water was just cold as we’d feared. Paddles went everywhere. We bounced off the boat and the rock and spilled down both sides of the river sputtering and trying to keep our heads above water. Pick a leader who will speak with a single unified voice. But, make sure he (or she) has a clear message and doesn’t keep changing direction. I’ve never set foot in a raft with Bob again. Bob always dumps the raft. If he goes on a rafting trip and doesn’t flip a raft, then obviously you’ve switched to a parallel universe.